KARACHI: Pakistanis may face a myriad problems day to day, but they appear to face them in their stride – at least that is what the United Nations World Happiness Index suggests. The latest iteration of the rankings sees Pakistan jump up eight spots from last year to become the 67th happiest country in the world. This year’s report – which traces countries’ evolution since 2005 – also names Pakistan among the top 20 gainers listed on the index. Rival India, meanwhile, was named among the 20 biggest losers after it dropped seven spots from last year to 140 on the list. 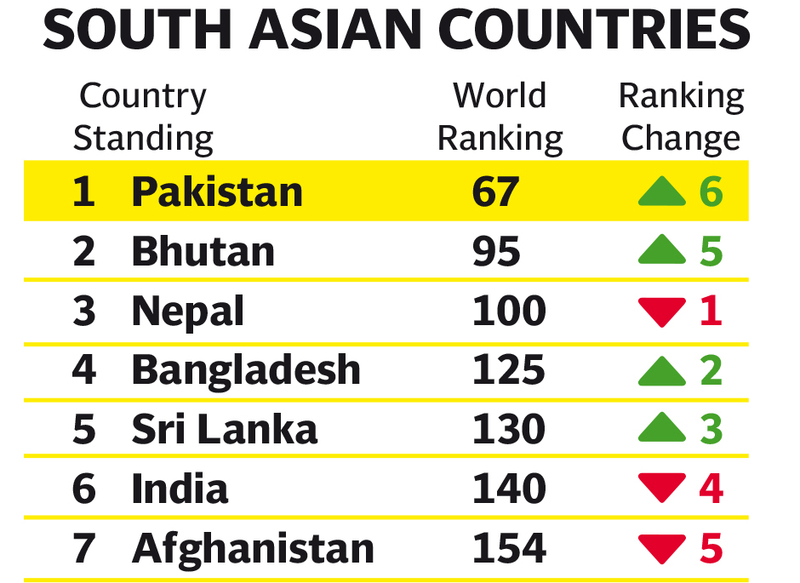 Like last year, Pakistan remained the happiest nation in South Asia, followed by Bhutan which was ranked 95. As for other countries in the region, Nepal was ranked 100, Bangladesh was ranked 125, Sri Lanka came in at 130 and Afghanistan, the unhappiest nation in South Asia, came in at 154. Scandinavian countries remained the happiest, like last year as well, with Finland securing first place ahead of Denmark and Norway. Iceland, the Netherlands, Switzerland, Sweden, New Zealand, Canada and Austria were other countries who made it to the top ten on the index. At 156, South Sudan was ranked the least happy country in the world where, according to the UN, more than 60% of the population has been facing food insecurity and effects of civil war. The survey ranks 156 countries by how happy their citizens perceive themselves to be and each year, different indicators are used to evaluate people’s happiness. The latest survey focused on six variables that support well-being, namely income per capita, life expectancy, social support, freedom, generosity and corruption. Although the survey to assess people’s happiness has been successfully conducted for the seventh time, the initiative is not without its critics. Many question how a feeling as abstract as happiness can be ‘measured.’ Others point to high suicide rates prevalent in the developed world together with the ever-increasing consumption of anti-depressants in countries like Denmark and Iceland. Authors of the report, however, say that the report is produced in line with the emerging science of happiness. “[It shows] that the quality of people’s lives can be coherently, reliably, and validly assessed by a variety of subjective well-being measures, collectively referred to then and in subsequent reports as happiness,” the authors of the report said. The report also noted that by and large, the levels of happiness have decreased across the globe despite continued economic growth, partly explained by the sinking of ranks among population-dense countries like the United States, Egypt and India. This shows that happiness and life satisfaction in terms of economic wealth alone is not enough. In 2017, Pakistan was ranked 80 on the index. It jumped to 75 last year and then 67 this year, showing that citizens have been reporting increased satisfaction across all six indicators used to evaluate happiness. Shedding light on the matter, associate professor at Karachi University’s Institute of Clinical Psychology, Dr Salman Shahzad said that factors related to good income, a healthy lifestyle and a strong sense of community add to the overall well-being of individuals. “On the surface, it appears as if Pakistanis face a lot of problems but we have to understand that every society works differently,” he said. Similarly, Dr Shahzad said that someone might not be financially strong but when they receive strong communal support from friends, family and through the institution of marriage, the value system helps them stay happy. As mentioned in the report, people believe that behaving generously can significantly increase happiness, especially when they are connected to people that they are helping and can see how their help is making a difference. “The idea of being charitable makes people feel good about themselves and when they tie the concept up with religious teachings, it makes them more satisfied and happy,” Dr Shahzad said. Similarly, when it comes to a healthy life expectancy, it is not necessarily related to happiness but a positive outlook and a higher purpose in life often keep people satisfied with their lives. “A healthy life expectancy doesn’t necessarily make someone happy as there could be a variety of problems in their lives, but people in Pakistan generally tend to associate things with religion and a higher purpose in life, which stops them from complaining,” explained Dr Mamoona Shafiq, associate professor in physiology at the Islamabad Medical and Dental College. “Sometimes, patients are in a lot of pain and distress but they attribute their illness to their worldly tests and keep a positive approach towards life. Such an attitude towards life may help people feel more satisfied and happy with their lives,” she said.